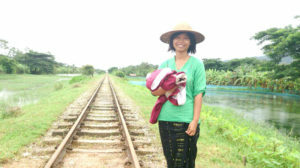 The 2015 Crawford Fund Fellowship has been awarded to Ms Aye Sandar Phyo from Myanmar. Ms Phyo is a Research Associate at the Asian Institute of Technology. She has a Master of Science (Regional and Rural Development Planning) from the Asian Institute of Technology in Thailand. The focus of Sandar’s research is the application of socioeconomic research to support improved agricultural practice. By linking agricultural innovations with social science knowledge on the social, cultural and institutional settings, agricultural innovations may be designed and adapted to better suit the local and regional context, and have more lasting impact for smallholder households. Since joining the ACIAR funded project Strengthening Institutional Capacity, Extension Services and Rural Livelihoods in the Central Dry Zone and Ayeyarwaddy Delta Regions of Myanmar, Sandar has lead qualitative and quantitative analysis of household livelihoods, change and rural dynamics. More details on Sandar’s work is in her citation, and information on her Fellowship visit to Australia, including her presentation, is here.